In the following year, 1964, Cubby Broccoli approached her again, and this time it led to Tania Mallet appearing in Goldfinger. Her character, Tilly Masterson, is out to avenge the death of her sister Jill Masterson (Shirley Eaton) who died, covered in gold paint, at the hands of Goldfinger's henchman, Oddjob. Sadly for Tilly, she too falls victim to Oddjob's famous steel rimmed hat! After Goldfinger, Tania Mallet went back successfuly to modelling, never to return to the silver screen. Tania Mallet was born in Blackpool in 1941, of an English father and a Russian mother. Tania attended schools in France and England after which, in 1957, she joined London's Lucy Clayton School of Modelling. She became one of Europe's top models and this meant regular 'cover-girl' appearances in the leading fashion magazines like Vogue. This got her noticed by Bond producer Cubby Broccoli, who was keen to have her in his next film. The part he had in mind was Tatiana Romanova in From Russia With Love, but Tania's lack of acting experience meant that this never materialised. 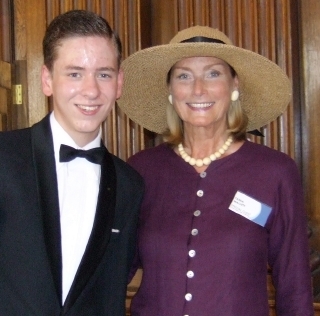 I met Tania Mallet at Pinewood in July 2006 for the 'Bond Girls Are Forever' day that was held there. She signed my Jeff Marshall lithograph of Goldfinger, my event programme for the day, and two photographs.